DEFENDING THE POTENTIAL OF UNION COUNTY YOUTH! Big Brothers Big Sisters helps Union County children ages 8-14 develop the foundational character strengths they need to reach their own potential. Each relationship is created by our professional staff and fostered by our program staff that monitors, supports, and nurtures each mentor-mentee relationship. We serve kids through both community-based and school-based mentoring programs. 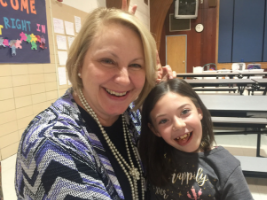 Big Brothers Big Sisters of Union County serves students at the following elementary schools in Union County: Northwood Elementary, North Union Elementary, Edgewood Elementary and Navin Elementary. Each week “Little’s” meet with their “Big’s” during lunch. School-based match activities are designed to build trust while encouraging meaningful dialogue. In addition, BBBS works with the child’s parents, school administrators and case workers to provide personalized, on-going support. Big Brothers Big Sisters of Union County also serves children ages 8-14 in our community-based program. Community-based mentors get together with their Little at least twice a month to develop a friendship, shared interested and activities. Mentors and youth participate in a variety of activities designed to enrich their lives and develop trust over time. The average length of a mentoring relationship is more than three years, and many of these relationships last a lifetime! Littles in our programs report an increase in self-esteem, are more confident in academics and are less likely to use drugs or alcohol. Kids are waiting — not so patiently — for a Big Brother or Big Sister. Please join us! To inquire, please contact us! We recruit, screen, match and support mentoring relationships that support children in our community when they need it most. If your child could benefit, please contact us! 19-year old Selena graduated from high school with her Big Sister Catherine Bond at her side. Selena lived with her single mother and younger brother. Her father is active and supportive in her life. Both parents knew that Selena had great potential and enrolled her in the Big Brothers Big Sisters program to provide additional support, opportunities and experiences. With her Big Sister at her side, and support of both parents, Selena overcame challenges in her life and has exceeded all expectations. In her senior year of high school, she enrolled in the Post-Secondary Enrollment Options Program at Columbus State Community College. She excelled in the program, made the Dean’s List and earned college credits. During her senior year, Selena was selected as a 2016 recipient of the Horatio Alger Trott Family Scholarship, which was awarded to her at a special ceremony in Washington, D.C. This prestigious scholarship is awarded to students based on their determination and hard work. Selena is now attending The Ohio State University. Brothers Jaylin, Michael and Cameron are all matched with Big Brothers! The three live in Columbus with their single maternal grandmother. She was given custody of them following the tragic death of both their parents almost 10 years ago. She has supported every area of the boys’ development, and she felt they needed something more: the additional support of a positive male role model. She reached out to Big Brothers Big Sisters of Central Ohio, and now they are all matched with the mentor and role model that their grandmother had hoped for. Her hopes for the boys are being realized by their current progress. Jaylin is an honor roll student who is also active in the ROTC. Michael is doing extremely well academically, and Cameron is in gifted classes. All are active in sports and have excelled in baseball and wrestling. The three boys, their Bigs and their grandmother were all featured in a Columbus Dispatch article on December 25, 2016! When 6-year old Laila met her Big Brothers Big Sisters mentor Elsa Pagliery in 2014, Laila’s reading skills needed some strengthening. Elsa, a Project Mentor volunteer from Highlights for Children, was committed to helping Laila develop the social and emotional competencies, and the academic foundation, she needs to succeed. The good news is that Laila’s reading grades have shown consistent improvement during the last two school years. Today, a Dr. Seuss library at home, and tomorrow a career involving books and research? Whatever Laila decides to pursue in life, she will have a stronger foundation thanks to her relationship with Elsa. That is what our 1:1 mentoring programs are about…opening up new possibilities, strengthening social and emotional competencies, and developing the foundation for post-secondary academic/career success. American Showa held its 2016 golf fundraising event supporting our Delaware County program on July 30 at the Delaware Golf Club. American Showa has provided support for Big Brothers Big Sisters for 23 consecutive years, and more than $405,000 has been donated through the outing to support our programming, impacting thousands of lives throughout Delaware County! Special thanks to American Showa Committee Members: Steve Carpenter, Joanne Hall, Bill Purtee, Mattie Robinson, Jerrod Hunt and Craig Myers. Major Sponsors were Air-Boss Flexible Products, Classic Solutions, Ice Miller Legal Counsel, Kecy Corporation, Crum Trucking and Master Products. Honorary/Dinner Sponsors were Atlas Industrial Contractors and Limbach Company. Key and Vehicle Sponsors were North American Stamping Group, Die-Matic Corporation, Mill Steel, RiAlto Manufacturing, Crane Worldwide Freight, Cintas Uniforms and American Micro. We had a great time on November 6 at Delaware Lanes! It was Bowl for Kids’ Sake time, our signature fundraising event that helps us serve children throughout Delaware County. We thank everyone who joined in along with local community supporters and generous businesses and sponsors to help our kids and have a ball! Special thanks to our presenting sponsors, Handwritten Forward and NorthStar Golf Club! Visit here for information about next year’s Bowl for Kids’ Sake. There are sponsorship opportunities available, too. If your company or organization would like to get in on the most fun fundraising opportunity in our community, please contact us at 740-369-2447. Everyone had a blast at Magic Mountain in July, and the kids had the opportunity to play putt-putt, eat pizza and even hang out with Brutus Buckeye! A special thanks to the Lewis Center/Polaris Rotary for hosting the event and providing a backpack filled with school supplies for each of our kids. Thanks to Ty Kashmiry, American Insurance Agent in Powell, for providing a bike helmet for each child and the Delaware General Health District for helping fit helmets. Our friends at the Lewis Center/Polaris Rotary also donated school supply items that allowed us to provide each child with a backpack full of school supplies to start the school year off on the right foot! The Springfield Quickball team traveled to Mansfield last July, and returned the winners of the Ohio Attorney General’s Statewide Quickball Tournament! The team was a partnership with Big Brothers Big Sisters, the Cal Ripken Foundation, the Springfield Police Department, Hayward Middle School and the Ohio Attorney General’s Office. It was part of the Badges for Baseball program funded by the Attorney General’s Office. Badges for Baseball included a 12-week class that taught students baseball techniques. They also learned about teamwork, leadership and choosing your own future, and got to play alongside Springfield police officers. Big Brothers Big Sisters helps coordinate the program, but participation was not limited to youth who were part of the Big Brothers Big Sisters program. The United Way of Clark, Champaign and Madison Counties’ 2-1-1/Information and Referral is available 24 hours a day/7 days a week. It has hundreds of solutions to everyday problems and can link you to many services including healthcare, counseling, food pantries, transportation, employment, volunteering, recreation, legal aid, tutoring and much more. Thanks, United Way! Find 211 at www.referweb.net/uwcc/. Each November, Big Brothers Big Sisters of Springfield holds its annual fundraiser, Bowl for Kids’ Sake, and all revenue raised by this event directly help children in Clark, Madison and Champaign counties. Companies, individuals and volunteers form teams, solicit sponsors and bowl to raise money to support the work of Big Brothers Big Sisters of Springfield. The Saturday evening bowling event is a real party atmosphere while the Sunday event is geared more for the family. Bowl for Kids’ Sake puts the FUN in fundraising! Hope you can join us this year — watch here for more information! Little Brother Dallas needed someone to bring even just a tiny bit of light into his life. Dallas has a learning disability which makes it difficult for him to communicate with his peers and do well in school. His parents also struggle to provide for Dallas and his brother. 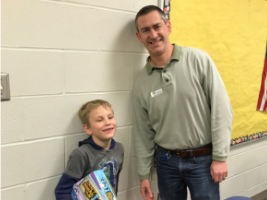 Since September of 2018, Dallas and his Big Brother Eric have met each week at Big Brothers Big Sisters’ school-based mentoring program at Navin Elementary. This weekly connection with his Big Brother Eric gives Dallas a safe space to express himself and the confidence to try new things. Since their first meeting, Dallas has grown into a warm-hearted kid with a big imagination. Big Brothers Big Sisters staff also works closely with his teachers, guidance counselors, and various community partners to ensure Dallas and his family receive ongoing support. The Big Brothers Big Sisters Program of Union County collaborates with other agencies to strengthen the support we provide to our Littles and their families. We coordinate supportive services for youth and families in our program with Community Action, The Hope Center, IMPACT60, Juvenile Court, Maryhaven, Marysville Schools, North Union Schools, Union County Board of Disabilities, and Union County Job and Family Services. We believe collaboration is an important part of living and working in Union County. This tight knit community makes relationships with other agencies a key to expanding and strengthening our services. In working directly with other agencies, we are better able to provide for the specific needs of the child. The Union County program of Big Brothers Big Sisters holds three fundraising events throughout the year: Bowl for Kids’ Sake in April, Big Brothers Big Sisters Charity Golf Outing in August and a third-party Clay Shooting fundraiser, hosted by OUPS, in September. To donate or to learn more about sponsorship opportunities, call Sara Koehl at 937-642-0472 or email skoehl@bbbscentralohio.org. Please get in touch if you want more information about the Union County Program of Big Brothers Big Sisters of Central Ohio. We want to talk to you. Are you ready to impact a child’s life for the better? We are looking for people who want to positively impact a child and engage in their community at the same time. We want you to get to know one of our kids, be a friend and make a difference, as you learn together. If you do not meet all these requirements, there are other ways to get involved with us! Follow us on social media, make a donation to help support our work in the community, sign up for our newsletter or advocate on our behalf through your networks and encourage others to get involved.